While I do not often frequent shopping centres, I do need to visit them sometimes and the ones I go to are Charlestown and Kotara. When I go to Charlestown Square, I travel behind St Pius College, through Kotara Homemaker centre and along Raspberry Gully Track, then up Aberfeldy Close (which I don’t actually ride, I push my bike as it is so steep). At the top of it, there is a short path and steps linking it to Benaud Street. From here I ride the short distance to Charlestown Road, then along Charlestown Road I ride on the footpath as the road has four lanes of fast traffic and no shoulder space and the footpath is usually empty. 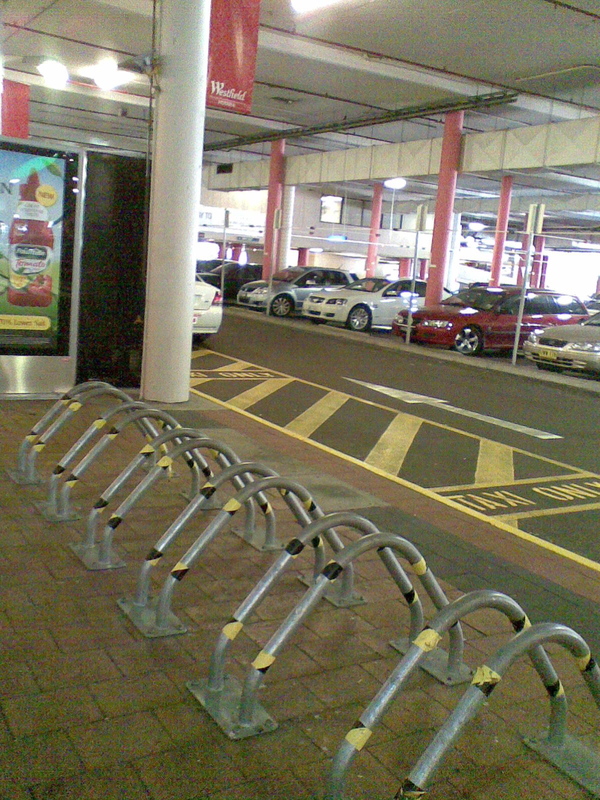 At Charlestown Square, there are plenty of bike racks and they are all situated outside the centre: It is relatively easy to get there from my direction, apart from the hill I have to climb, and access into the centre is easy once there as there is no navigating the car parks. To get to Westfield Kotara, I ride along the bike path behind St Pius College and from there along the shared paths leading to the Centre, crossing at the pedestrian lights near the Centre. Once there, I follow the pedestrian path to get in, as the traffic entrance, comprising a roundabout under cover and therefore in darkness, is quite dangerous. From here, I go between the parked cars and then ride through the car park with the cars, though the car parks are dark in places. 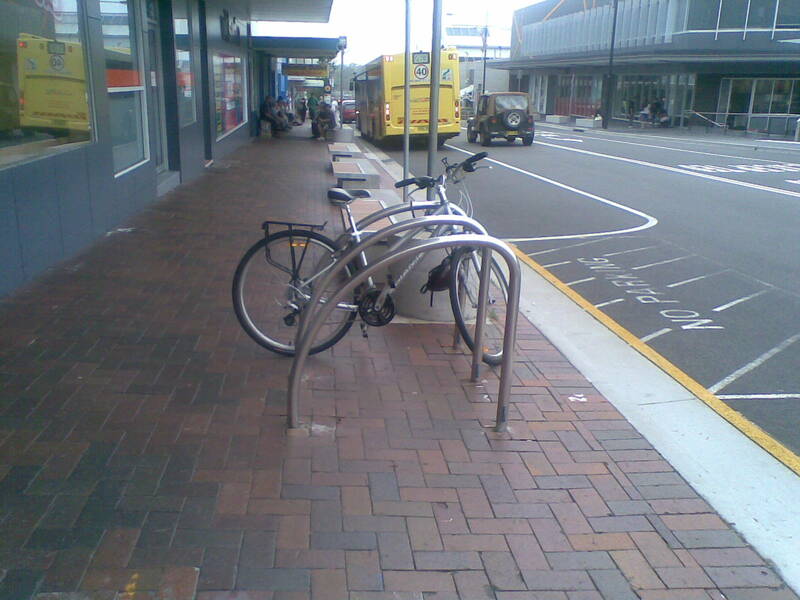 I head as quickly as I can to the pedestrian crossing and the bike racks which are located right outside the shops: The bizarre part of this is that, while the bike paths leading to this Centre are flat and well separated from the roads, the track leading into the Centre is not well defined for bikes, and there is no designated route to the bike racks. There are more and more bikes being used at this centre, I usually count at least 6 when I go there, whereas last year there would be only mine. I hope that a designated path is put into place or a rack is built near to the path, where some already park their bikes, attaching them to handrails. Both these centres have parking problems, which could be greatly alleviated if more people rode bikes, but the mish mash of infrastructure available means that not many take the option of riding at present. 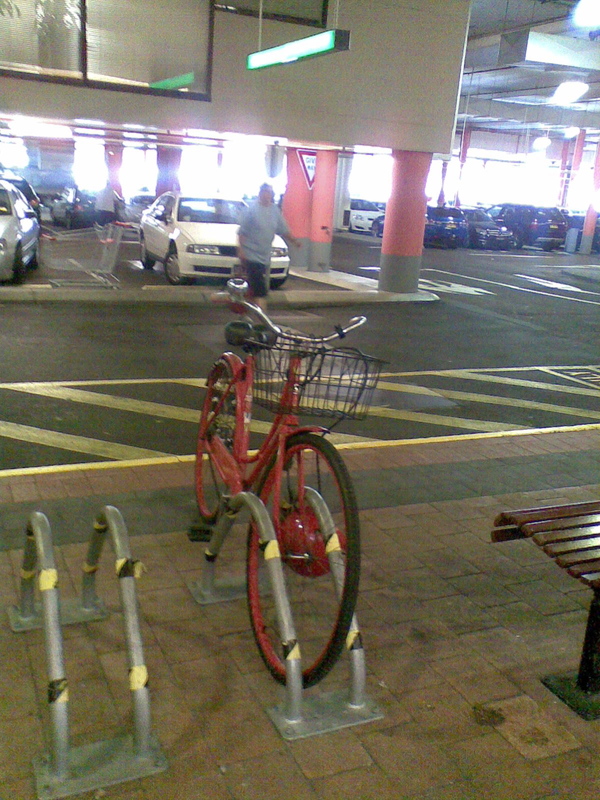 This entry was posted in Bike tracks and tagged Bike parking, bike racks, infrastructure, newcastle, newcastle bike tracks, Raspberry Gully, shopping centres. Bookmark the permalink. 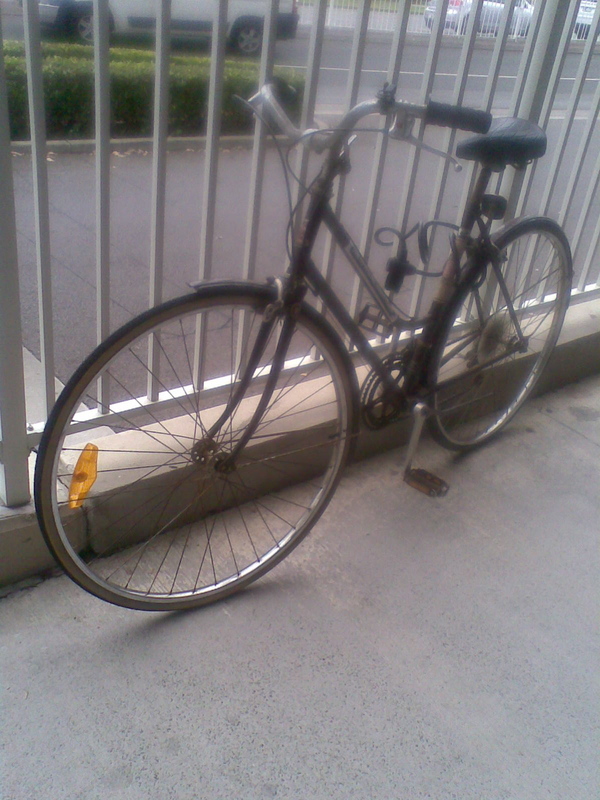 There are a couple of problems with the bike racks at Kotara. One is that they are all a long way from the entrances by the supermarkets. My main reason for heading to Kotara is to go to Woolworths and I always lock my bike to the railing near the store because there’s plenty of space and that awkward corner that no one uses. Another issue is access, as you’ve noted. Pedestrian access is also pretty bad. The whole place is totally dominated by vehicle access with bikes and peds a total afterthought. By far my biggest problem with Kotara is the bike stands themselves. They are a terrible design that doesn’t really support your bike, doesn’t easily enable it to be locked properly, and makes it very likely your bike will get damaged. Charlestown have it right with those proper Sheffield stands. 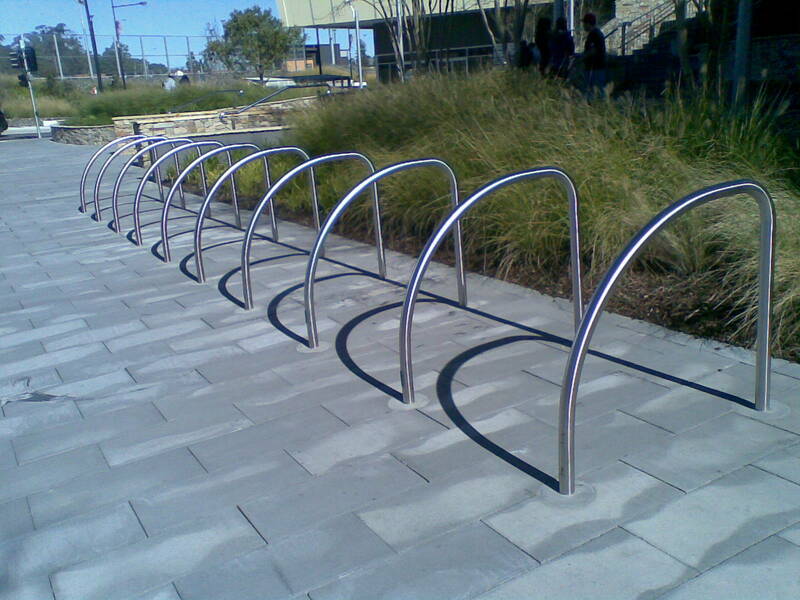 The only bike racks I’ve seen that are worse than Kotara are at Broadmeadow station where I lock my bike to a post every day rather than risk the bike rack. Great comment Adam and I agree with you entirely! 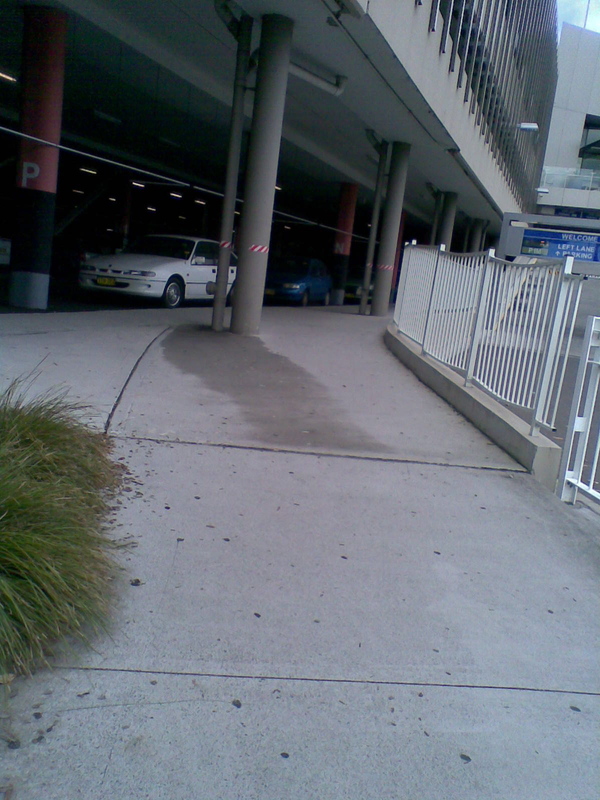 Pedestrians do struggle with the same issues at Kotara. The car parks are not set up well to cater for them. Regarding the bike racks, I notice it is hard to get my Giant bike into them, but my Speedwell, with slimmer wheels, is fine, though I do worry about the bikes falling over while in the racks. I think the fact that the racks are underutilised is the only reason this does not happen. If many people were getting bikes in and out of them, it would be a problem. Management at Kotara does not seem to mind that people use handrails all over the place to lock up their bikes, but maybe that should be a statement to them regarding their infrastructure. I am currently doing research in developing bike racks in the Newcastle area, and i would love to talk to you about research opportunities. If possible, would you be able to contact me if you would like to discuss this further? I have a concern racks on Fredrick Street Charlestown is that they away from hi intensity public view. Because of deliberate damage to bicycle wheels and frames while parked in that location, while they are in open view the number of general public in the vicinity to act as a deterrent to vandalism is extremely low. A better additional location to park and secure bicycles would be in the open court area of the South Piazza. I do acknowledge there are that the stairs are somewhat of an obstacle. The other location that has reasonable public interaction and fewer problems with stairs is the entrance at the northern end of the complex, just out side of the Pet Shop. The only one drawback is the number of youth that congregate there at times. Anyone one else have any thoughts? Richard, I park my bike in Ridley st and have never had a problem. I agree that the stairs would be a problem for the racks you are talking about, if they were to be located in the piazza.